When I first arrived in the Osa for my birding experience, the tremendous diversity of birds astounded me. I seemed to spot a new species each time I walk into the forest around Osa Conservation’s biological station. Even at the station itself, I saw such birds as the Fiery-billed Aracari, an endemic species in both Panama and Costa Rica. The species diversity stems, in large part, from the selective pressure insectivorous birds put on their prey. This causes insects to adapt in order to evade their avian predators. In turn, the bird predators must specialize alongside their prey to catch the insects. The Black-cheeked Ant Tanager is one of these insectivorous birds and is only found in the Osa Peninsula! Its population numbers fewer than 15,000 individuals. 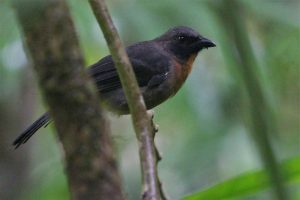 I found Black-cheeked Ant Tanagers at four different locations in the area and spent hours noting their presence in mixed species flocks and observing their fascinating behavior. I also studied Manakin distribution around Osa Conservation by birding the surrounding trails and recording their presence in a GPS. I was thrilled to find 21 unique locations and view at least 5 leks. A lek is when birds perform elaborate mating displays. 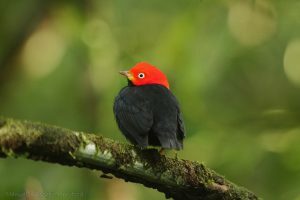 Red-capped Manakins tended to be concentrated in primary forest either near the border of secondary forest or in a clearing from tree falls, which create patches of secondary growth. Another highlight from my time here was helping to conduct point counts of birds in areas that will be reforested with different concentrations of the fast-growing balsa tree, an experiment that tests the efficacy of this idea for reforestation. Learning the methodology for conducting point counts, as well as understanding the reason for using them in grasslands, fascinated me. These counts reflected the Osa’s enormous avian diversity, and I am glad that I contributed to such an important project that could help the birds that I am so passionate about. 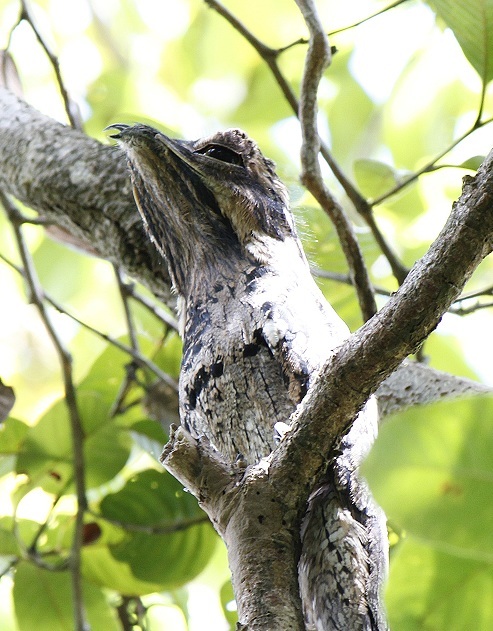 Birding in the Osa was a unique experience that allowed me to learn about and contribute to avian diversity. 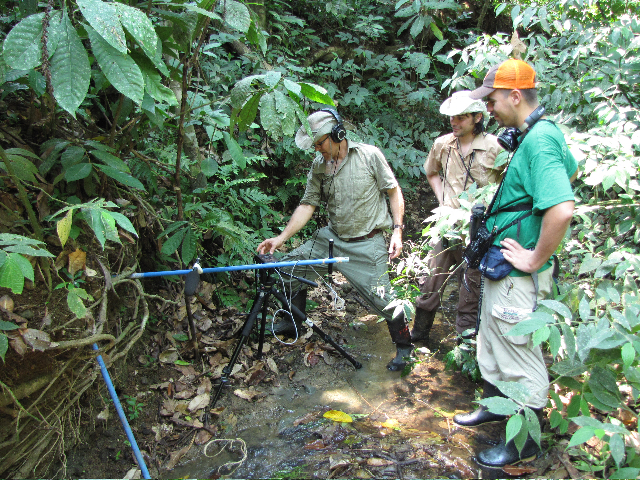 If you’ve ever spent the night in the rainforest you know how deceptive sound can be. Unlike the intriguing daytime peeps, flaps, buzzes and calls that inspire one to explore deeper into holes, hollows, and underbrush, the haunting sounds that pierce the blackness of night cause the uninitiated like me to wholeheartedly question their disbelief of ghosts, goblins and spell-casting forest witches. Nighttime at Piro has a way of transforming torrential downpour into slowly approaching footsteps, guttural howler calls into sinister forest cries. Especially haunting is one sound that I really would have sworn was a ‘bruja’ laughing slowly and eerily into a wooden whistle repeatedly throughout the night. As part of conservation efforts for the Scarlet Macaw, artificial nests have been installed in two colleges and five schools. 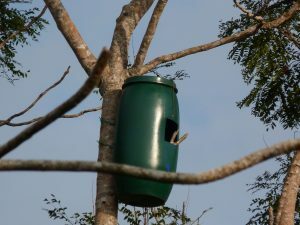 In each school, trees with easy visibility were chosen for students based on characteristics of diameter and height for the installation of the nests. 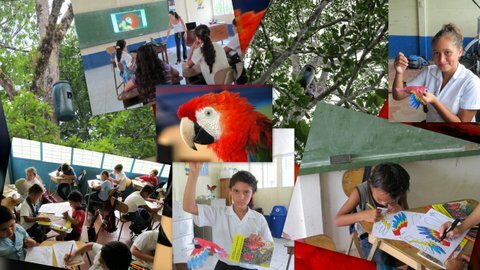 Students of these schools attended a workshop on ecology, life cycles and the importance of conservation of the species Ara macao. Students from the 5th, 6th, and 9th grades are in charge of monitoring macaw activities and noting events such as flights and perching near the nests and when a macaw investigates the inside of a nest. They also monitor the activity of other species near the nest. So what’s the difference between a Hermit and a Hummingbird? 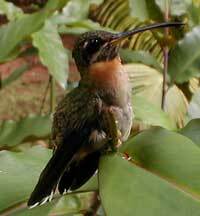 Hermits are hummingbirds but they do have some characteristic differences between them. Hermit feathers are typically brown, rufous, green, and gray in color and do not have the iridescent plumage that hummingbirds do. There is often little difference in appearance between the sexes normally seen in most hummingbirds. The Band-tailed Barbthroat is known for its round tail which is banded in black and white with two green center tail feathers which extend farther out looking as if they were dipped in white paint. Interestingly, this hermit forms breeding leks. Males gather in courtship groups also known as leks which is the traditional display ground where females come to choose their mate. 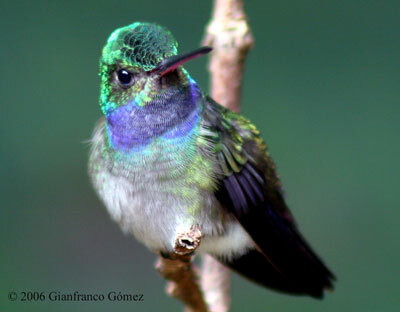 They are less aggressively territorial than hummingbirds which tend to defend particular flowers as their territories, hence the brighter iridescent feathers against their chosen flowers. Nests are small cups attached to the underside of Heliconia or banana leaves up to 4 meters high; using the leaf as a bit of cover allowing for much needed respite during heavy rains. We would like to thank Gianfranco Gomez from the Drake Bay Rainforest Chalet and Photographs by Bob Levy for their stunning photographs and allowing us to showcase them. You can find them just up the coast from us in Drake Bay, Costa Rica. The Osa Peninsula is known for its high level of biodiversity and is one of the most “biologically intense” places on earth according to National Geographic. The Osa has over half of all species found in Costa Rica. This is evident in the over 400 bird species found here. That’s quite a few birds for such a small area. Well, its time then to make them heard; to record their songs, calls, mews, ooo’s, churrs, drumming and scolding notes and make them available for all to listen to. prompting the group to once again descend upon the Osa for round two in mid April. 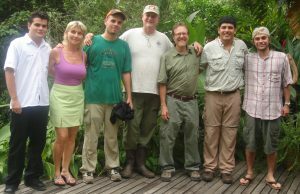 The expertise of the group expanded significantly with the addition of Costa Rican birding experts Leo Garrigues, Gary Feliz and Oscar Herrera, and with Karen Leavelle with Friends of the Osa. 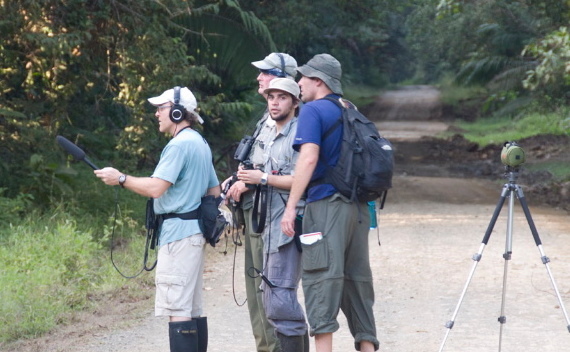 Now Gary, Oscar, and Karen who reside on the Osa can simply walk outside and record when they wake up in the morning! This recording group has travelled from Luna Lodge at Carate to Friends of the Osa’s Osa Biodiversity Center, out to Cabo Matapalo and Puerto Jimenez, Bosque del Rio Tigre Lodge and everywhere in between. This group has even gone all the way over to the Rincon mangroves on the Golfo Dulce side where one can find the endangered Yellow-billed Cotinga and the Mangrove Hummingbird. So why record all this wildlife? Education, Education, Education. One intention is to create one or more CDs that could facilitate the training of aspiring local naturalists. 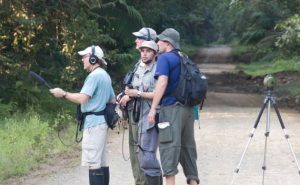 Also, birders who come to the Osa can learn some songs before being inundated by the local avifauna when they get off the plane at Puerto Jimenez. Researchers and students will also benefit as well as local guides who work in this amazing environment. We also hope to have songs linked to the Friends of the Osa website along with a bit of natural history and images to allow folks to make visual connections with Osa wildlife. Oscar Herrera, Lana Wedmore, Leo Garrigues, Tim Burr, Jeff Woodman, Gary Feliz & Luis Vargas at the end of a long recording trip. We will of course keep you updated on this amazing project and gigantic undertaking as we progress. Look out for more blog posts showcasing a particular bird species, its ecology and the bird’s song or call in its partially edited version. Final edits will be made by recording specialist Al Houghton out of New York. Also known as the Beryl-crowned Hummingbird the Charming Hummingbird (Amazilia decora) is regionally endemic to the Southern Pacific lowlands and coastal areas of Costa Rica north to Carara and Panama. It is sometimes considered conspecific with the Blue-chested Hummingbird found on the Caribbean slope as they are nearly identical. 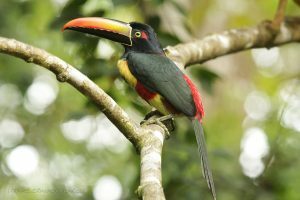 You will often see them in coffee plantations, gardens, forest edges and along streams and open clearings feeding on Inga, Hamelia, Satryia and Heliconia. Like many tropical species Charming Hummingbirds form courtship assemblies or “leks” of up to 12 males where males gather to advertise their courtship display and land themselves a female breeding partner. Interestingly, males and females that defend territories at flowers such as the Charming Hummingbird are those hummingbird species that are brightly colored to show off their iridescent costumes in contrast to the flowers. Hermits do not hold territories in the same way and are not generally very colorful in comparison. More on hermits though another week. Charming Hummingbirds will breed throughout most of the year expect for the height of the dry season. We would like to thank Gianfranco Gomez from the Drake Bay Rainforest Chalet http://www.drakebayholiday.com or http://www.thenighttour.com for their stunning photographs and allowing us to showcase them. You can find them just up the Pacific coast from us in Drake Bay, Costa Rica.